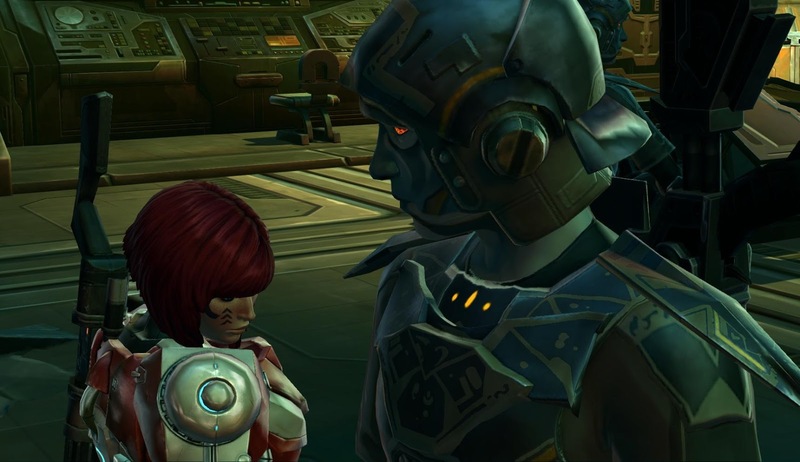 I couldn't find any sort of official lore statement about it, but apparently the Voss are meant to be freakishly tall. I can't say I ever noticed while out and about on Voss (maybe because I'm used to NPC sizes being a bit incongruous sometimes, see raid bosses) but apparently people have brought it up on Reddit and on the official forums many times. It certainly struck me during this trooper mission though, where it's strongly emphasised by the camera angle. WTF, when did this Commando grow to be three metres tall? Apparently I just never noticed. 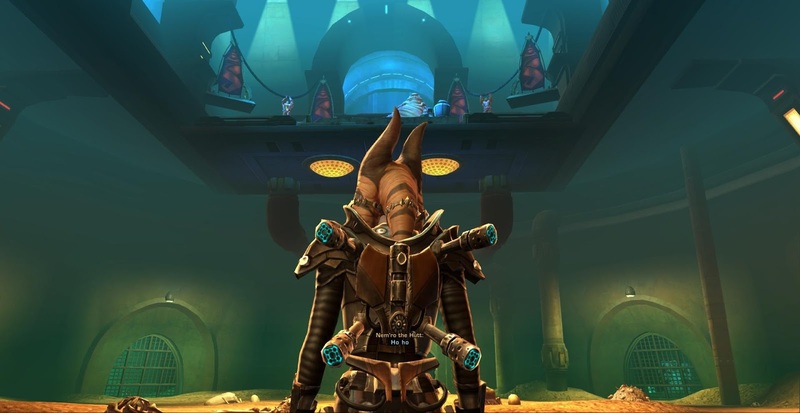 I've written about the class stories on Rishi before, and the bounty hunter one was definitely my favourite of the Imperial ones. I absolutely didn't like what happened in it, but it was told well and actually managed to make me feel upset about the death of an NPC. When it comes to getting your first lightsaber, the Jedi definitely have the lead in terms of epic moments, because crafting it yourself while using the Force is immeasurably more satisfying than fetching someone else's from an old tomb. 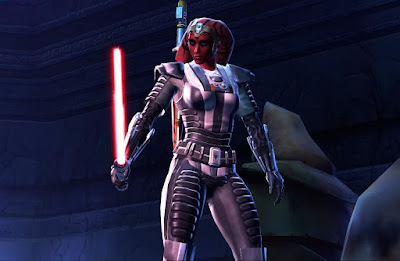 Still, that doesn't mean that getting your first lightsaber as a Sith warrior isn't a cool moment. I like how your character inspects and weighs it in her hands. 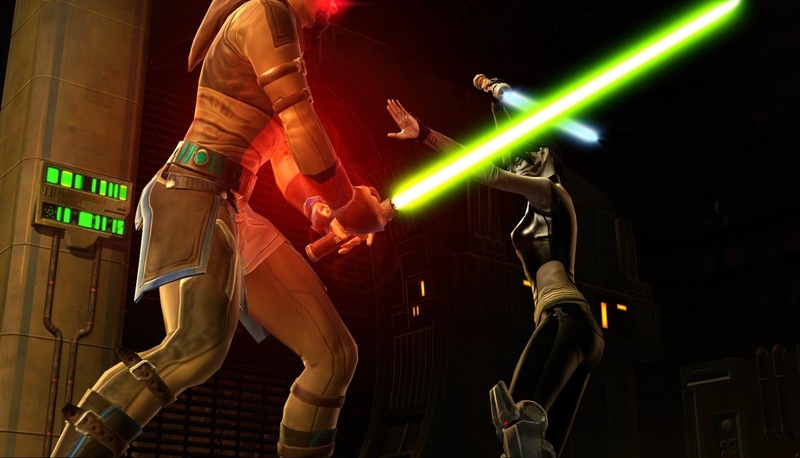 Speaking of cool moments with lightsabers, the Sith warrior's chapter one end fight is pretty neat as well. Unfortunately it has suffered a bit from the introduction of level scaling, as it takes place on Hutta, meaning the boss is like... level eight or something now and a massive pushover. 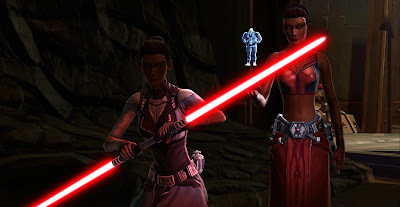 Do you know where these two lovely Sith ladies feature? It's the smuggler story! I had completely forgotten about them until I played through it again with my Dark vs. Light smuggler. This is why content is definitely worth repeating after a while. 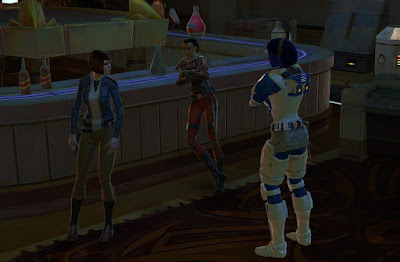 I just love this shot from the early bounty hunter story. I can almost hear my character sigh in exasperation at being thrown into a beast pit.